Since 2006, Isabella's has been sharing our passion for great food and hand crafted espresso beverages, our love of art and music and the excitement we feel when discovering unique gifts, with our patrons and guests. We continue to offer handmade chocolate, in-house baked goods and premium coffee and teas, inside our cozy space located on the corners of Simcoe and King Streets in Oshawa. We invite you to visit our soon to be launched Isabella's Shop, follow us on Facebook, Twitter & Instagram or say 'hello' to us in person. ham, oven roasted chicken, roast beef, tuna & dill, B.L.T. E-mail rosanna@isabellas.ca for details on what we have to offer, and to provide a quote. We appreciate advanced notice for catering orders. 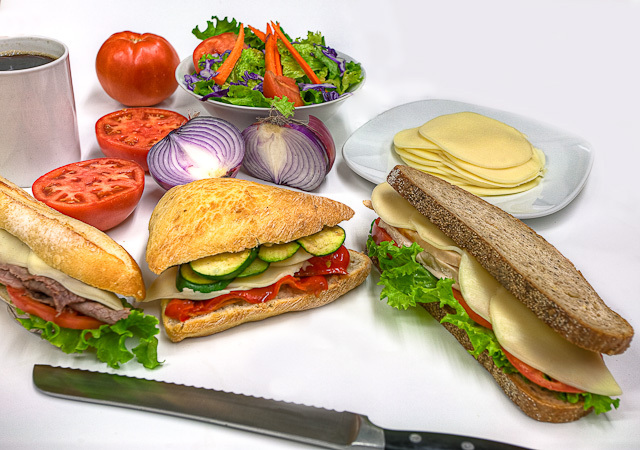 Share platters of our in-house crafted sandwiches and grilled panini, our fresh salads, an assortment of baked goods, fresh fruit, and brewed coffee or tea with guests during your meetings, special events or office gatherings. Need to get what's on your mind, off your mind? Have a question? Please fill out the form and click submit. We'll get back to you as soon as possible.